Get request from customer in the prescribed pre-printed form. Use CMRC menu, Modify CIF and fill all mandatory fields : Mobile no, email id, DOB, PAN and mother's maiden name. Click on enable Net banking, submit & verify. If photo and signature are not available, get fresh KYC form. Customer will get SMS after 24 hours with an internet banking link. 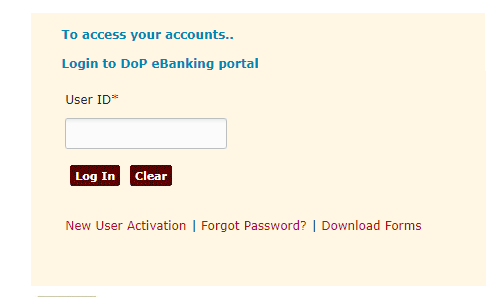 Customer can activate DoP Internet banking using the provided link with his CIF ID and Account ID. Account ID is SB A/C No. Customer will receive an OTP on registered mobile number for activating Internet Banking. Default USER ID is CIF ID.